Paschal has supplied formwork for an 18-storey building in Juffair for Hassan Al Ansari. 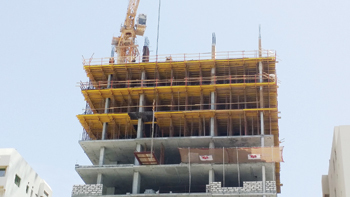 BAHRAIN-based Paschal Concrete Forms says numerous contractors in the country are now using modular formwork from its parent company Paschal Werk G Maier, having realised the many benefits of using these systems on their projects. Ahmed Mansoor Al Al Aali, Nass Contracting, Dadabhai Construction, Kooheji Contractors, Poullaides Construction Company (PCC), GP Zachriades, KMC Contracting, Olympic Contracting, Bokhowa Construction, Taitoon Contracting, Chapo and Fundament SPC are among the contractors that are currently using Paschal formwork for the construction of their projects in Bahrain, says Amir Delghandi, general director of Paschal Concrete Forms. Currently, Paschal formwork is also being used at the Madinah Al Shamaliya (Northern Town) project by a number of contractors including Ahmed Mansoor Al Aali, Ahmed Omar Contracting and Almoayyed Contracting. Headquartered in Germany and with customers in more than 40 countries, Paschal is a sought-after partner for concrete projects worldwide. Its range of services includes the development and production of formwork and shoring systems, global distribution, and consulting and additional construction services. Its regional office Paschal Concrete Forms has supplied formwork for a number of ongoing projects in Bahrain. Paschal modular formwork is being supplied to construct the basement and tunnel walls for Bahrain In-door Skydiving (BISD) centre at Wasmiya – which is the first-of-its-kind project in Bahrain, featuring one of the tallest indoor skydiving tunnels in the world; for a 11-storey building in Riffa for the columns, staircase walls and lift walls; as well as for the Kuwait Embassy Residence House project – all of which are being built by PCC. Furthermore, its formwork is being used in the construction of Dragon City at Diyar Al Muharraq by Nass Contracting as well as by Taitoon Contracting in the construction of slabs (deck system) for staff accommodation/apartments at the development, says Salinraj Kunnummal, technical manager at Paschal Concrete Forms. Taitoon Contracting is also using the formwork to shape up the columns and lift walls at 360 Degree apartments at Durrat Marina and the columns for residential buildings at Reef Island. Dadabhai Construction is building Juffair Heights and Mirage Centre (supermarket and car park) at Al Ahli Club using Paschal’s modular formwork for the columns, beams and core wall in the former project and for columns and beams in the latter. According to Delghandi, other projects where Paschal’s modular formwork is being employed are Zawya Three residential tower and another residential tower at Amwaj, where Chapo is using the systems for the construction of columns; Isa Town mixed-use development (Olympic Contracting) in the construction columns; a school project at Busaiteen (Bokhowa Construction) for the columns and beams; and the columns of the mall and clinic at Wadi Al Sail (KMC Contracting). Yet another leading contractor Ahmed Mansoor Al Aali is using the modular formwork, with the polygonal system, in the water transmission development project at Budaiya; while Kooheji Contractors is currently using Paschal’s modular formwork and deck systems for the construction of columns, core walls and slabs for bachelor-enlisted quarters in Mina Salman, Spring Hills One, Two and Three in Juffair, Spring Hills Four at Amwaj, and Fontana Gardens in Juffair. Other landmark projects to which Paschal has supplied in the past two years include Q House 3, an 18-storey building in Juffair (Hassan Al Ansari Contracting); the new Tatweer Petroleum office building at Sakhir (Poullaides); Muharraq sewage treatment plant at Hidd (Samsung, GPZ and Poullaides); a 20-storey building in Juffair (Zinj Transport); Tubli water pollution control centre (WPCC) (Atlas Transport); Muharraq Seef Mall, a community hall and a six-storey residential building at Riffa (Almoayyed Contracting); JBF Factory at Bahrain International Investment Park (BIIP) (Ahmed Mansoor Al Aali); Sulb steel mill at Hidd (GPZ, Amana, Kooheji Contracting and Poullaides); Muharraq Health Centre (Aradous Construction); Qatar Embassy (Kooheji Contractors); United Tower at Bahrain Bay (Ahmed Qaed Contractors) Saar Mall (Bokhowa Construction); and various villas and buildings in Juffair and Amwaj Islands. Paschal made its debut in the region in the early 1970s by supplying formwork for a dam project in Saudi Arabia. Subsequently, it supplied to other civil projects in Kuwait and Bahrain from its main office in Germany. However, to meet the increasing demand for formwork in the region, Paschal Concrete Forms was set up in Bahrain as the main office for the Middle East in 1997. It has since become one of the leading suppliers by providing modern formwork solutions to the construction industry.